Hospers, IA – The Iowa Committee for Employer Support of the Guard and Reserve (ESGR), an agency of the Department of Defense, announced today that John G. Den Hartog, President of Den Hartog Industries, Inc., was honored with a Patriot Award in recognition of extraordinary support of its employees who serve in the Iowa National Guard and Reserve. Shawn Broesder, nominator, started his employment with Den Hartog Industries, Inc. in April of 2004. In 2005 Shawn left for duty with the Army National Guard Reserves, upon their return the unit became known for spending the most consecutive days in Iraq for one tour. Less than four years later Shawn entered himself into another challenging, yet rewarding, situation. Shawn’s latest journey included training newer soldiers of the 2168th Transportation Company based out of Sheldon. His duty was to train the soldiers the tasks and drills needed prior to going overseas. In August of 2010 they were deployed to Camp Shelby Mississippi for another month of training, followed by additional exercises in the Mojave Desert in California before their ultimate departure to Bagram, Afghanistan. 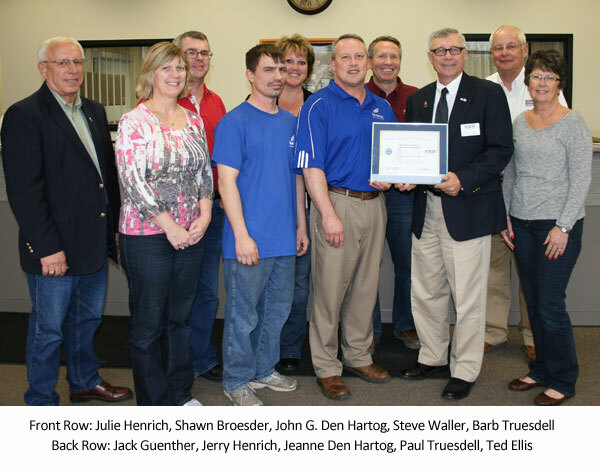 In September 2011 Den Hartog Industries was fortunate to receive a Freedom Award nomination from the ESGR. The Freedom Award is the highest recognition given by the U.S. Government to employers for their outstanding support of employees who serve in the Guard and Reserve. As the 1.3 million members of the National Guard and Reserve continue to perform an increasing number of unique missions with America’s borders and beyond, ESGR will continue to be the resource for the employers of citizen warriors. ESGR provides education, consultation, and if necessary mediation for employers of Guard and Reserve employees. More information about ESGR Employer Outreach Programs and volunteer opportunities is available at www.esgr.mil, or by calling (800) 294-6607.